Filmed over 12 years, Richard Linklater's project is a unique accomplishment. Growing up is a universal experience that everyone can relate to, but Richard Linklater’s latest film puts a new twist on the classic coming of age story. He decided in 2002 that he wanted to do a film about a boy which followed him from grade one until he went to college, but he decided to use the same actor to achieve the continuity and authenticity he desired. 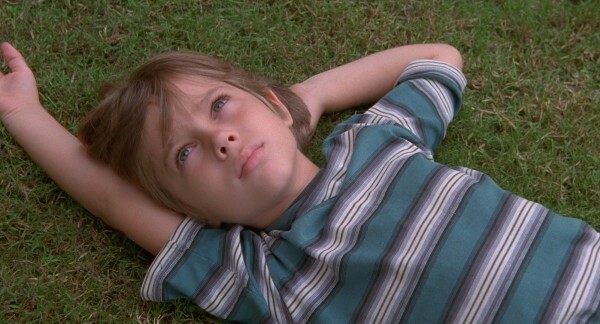 Ellar Coltrane was hired to play Mason Jr., and the film follows Mason from the time he’s six until he’s 18. Ethan Hawke and Patricia Arquette play his separated parents, and Linklater’s daughter plays Mason’s sister, Samantha. We see Mason reach many of life’s milestones and go through experiences that most boys and men can relate to like spending long hours playing video games, riding bikes around the neighbourhood, looking through lingerie catalogues with friends, and having that first beer. With their mom doing her best as a single parent while going to school, Mason and Samantha are forced to move around the state of Texas as she follows her dream, goes to college, and becomes a college professor herself. Along the way she marries one of her college professors, divorces him, and then marries one of her students, which also doesn’t work out. Mason Sr. is the absentee dad who shows up every second weekend with presents and tries to make himself look much cooler than their mother. During the early years of the film, he is quite irresponsible, but we see him mature as well and eventually settle down. Mason doesn’t like the two men that his mother marries, and ends up having a strong relationship with his dad. Of course there are the awkward teen years where Mason is getting interested in girls and lying about how many he has slept with, and there is a great scene where their dad tells a 15-year old Samantha to make sure she always uses a condom. Mason falls in love with his first girlfriend, Sheena, and they plan to move to Austin to go to college. Mason’s ambivalence towards most things is something that I think a lot of boys can relate to at that age, along with his struggle to figure out what he wants in life. Although he plans to attend college, he isn’t sure that it will be a transformative experience. The film is quite long at two hours and 45 minutes and could have come across as a series of short films strung together, but the development of the characters over the years added an extra level of credibility that could not have been achieved any other way. The performances are all nuanced and authentic, and this film is one long portrait of boyhood from childhood, through adolescence, to adulthood with a plot specific enough to keep you entertained and a premise general enough to be universal. Listen to a podcast on the film the I participated in.